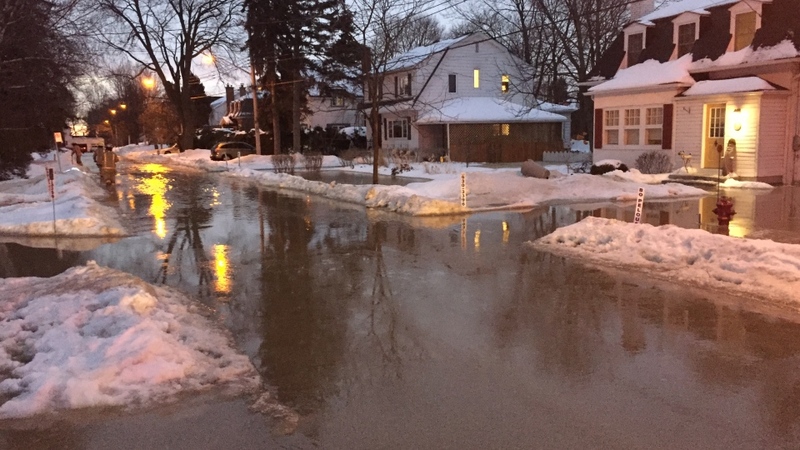 A water main break sent water cascading down West Island streets on Wednesday morning, causing severe damage to several homes. The flooding was especially bad in Pointe-Claire near Victoria Ave. and Marianne. 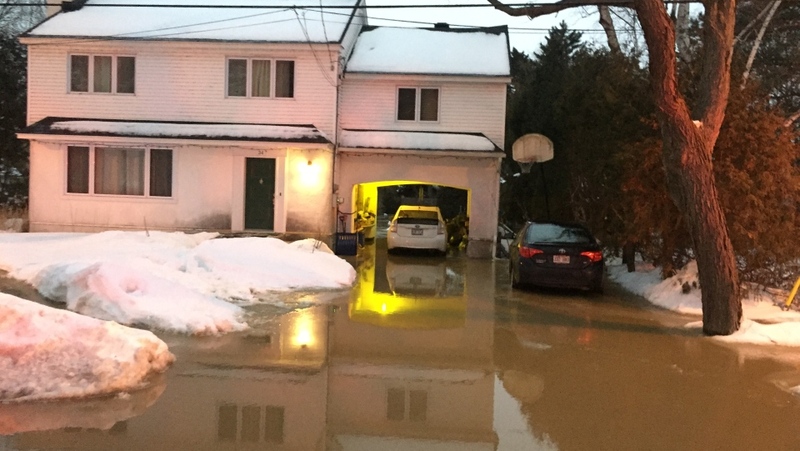 Firefighters said it was caused by a broken water main at around 4:30 a.m.
About 10 homes were damaged by the flooding and officials said the residents may be forced from their homes for as long as a week. Power was shut down and three water mains were closed due to the repair work. "We have adirondack chairs, and I noticed I could just see the top six inches of the chairs," said homeowner David Johnston, whose basement was flooded. "I said 'what is this? What's going on?'" "I'm happy there were no personal injuries, it's just property," Johnston added. Firefighters said the break may have been caused by severe fluctuations in temperature over the last few days. 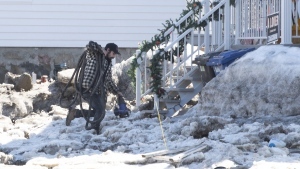 Pointe Claire's mayor, however, blamed the wild temperature swings for the pipe's rupture. "We've had cold, cold spells of minus 25, and then three days later it's plus six and the worst scenario for a water main," John Belvedere explained. On Thursday morning Lakeshore Rd. was reopened to traffic, but the water main was still broken. Several homes were under boil water advisories, while those on Victoria Ave. had no water at all. The floods come a day after temperatures went above freezing in the Montreal area before plummeting to -13C overnight. Streets and sidewalks were coated in ice on Tuesday, forcing several schools north of Montreal to close. Temperatures are forecast to rise above OC on Thursday and Friday, according to Environment Canada, before falling again on the weekend. A freezing drizzle advisory was issued for the Montreal area, with Environment Canada warning it could last for much of Thursday. The organization said drivers and pedestrians should be extra cautious as roads, highways, parking lots and walkways can become extremely slippery. Last year, the city spent $22 million patching potholes. Mayor Valerie Plante says with changing weather patterns and spring flooding imminent, her administration will likely have to start spending more. "And I know maybe for some citizens this is not the answer they want to hear, but we do need, as a city, to ask ourselves what does it mean to be dealing with those changes in the weather, Plante said Wednesday. "I know that for my perspective, it probably means adding more money next year," she added. Back in Pointe Claire, the broke pipe means power has been cut to the area. Several families could be out of their homes for days as they deal with the cleanup and insurance claims. "It's another example of how difficult things are getting in winter, especially in Montreal where we have old infrastructure," Johnston added. The Quebec government is promising more help for victims of natural disasters, Public Security Minister Genevieve Guilbault announced Wednesday afternoon. Guilbault says almost as soon as she was sworn in, she was asked by Premier Francois Legault to create a new program to help disaster victims considering the unprecedented flooding back in the spring of 2017. The tabled bill aims to prevent the situation from repeating itself by reducing the bureaucratic process to make it easier and faster to process insurance claims. Guilbault says with the new legislation, the government would be required to follow through on how much compensation each victim is entitled to - but was short on details about how exactly the plan would work.